Villa Ria offers the privacy, character and personal comfort of a private home with the amenities, guest services and high standards of a luxury hotel. It is professionally managed and supervised by Diana Group who will confirm your reservation details, coordinate your airport transfer, arrange transportation needs during your stay, and oversee the staff throughout your visit. They are available to help with any questions, special requests or in case of an emergency. They have trained our excellent staff of five to provide unobtrusive, professional service that is also friendly and personalized to meet the individual needs of our guests. Our 24 hour staff includes senior staff member and excellent cook Nengah, as well as our housemaid Ketut. Both of whom speak excellent English. 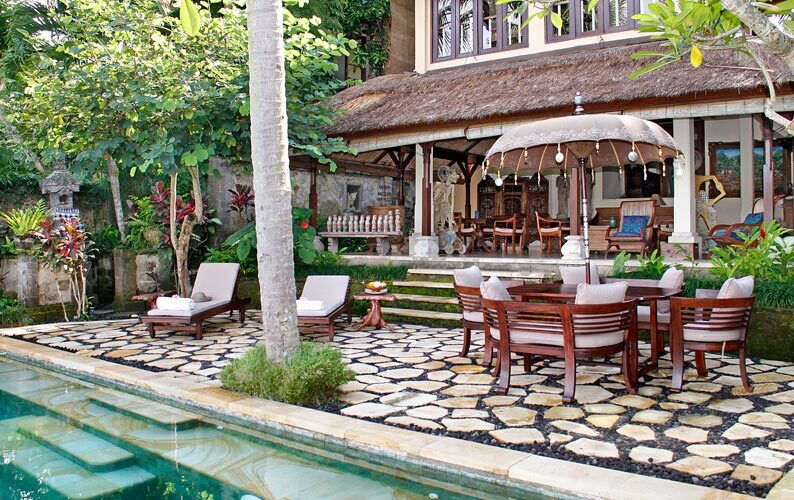 Our additional staff includes gardener and pool attendant Wayan, and our two satpams, Made and Ketut who support the household staff and provide security. 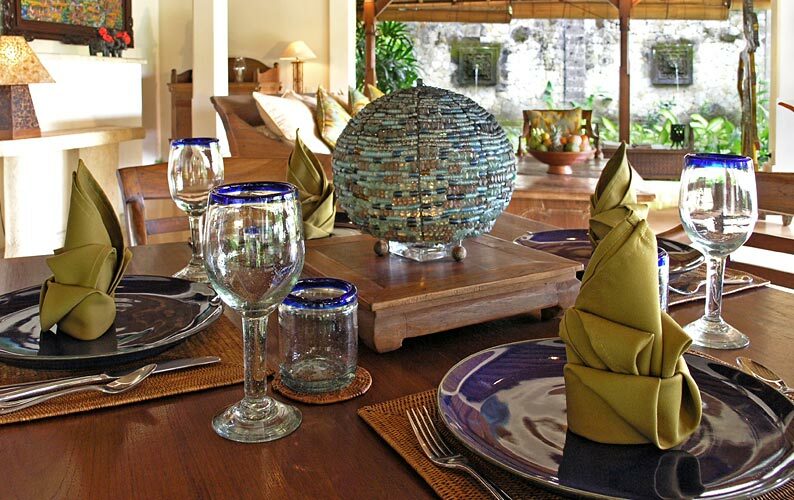 Villa Ria's Private Dining Menu has been prepared by a chef of a five star resort who also trained the staff in safe food handling, preparation and presentation. Daily breakfast, lunch, cocktail snacks, and dinner are available. Guests are charged for ingredients used in meal preparation plus a 20% fee on top of total shopping invoice for ingredients. You may choose from numerous delicious selections including Banana Pancakes, Iken Pepes, Thai Red Curry, and rich Chocolate Cake. 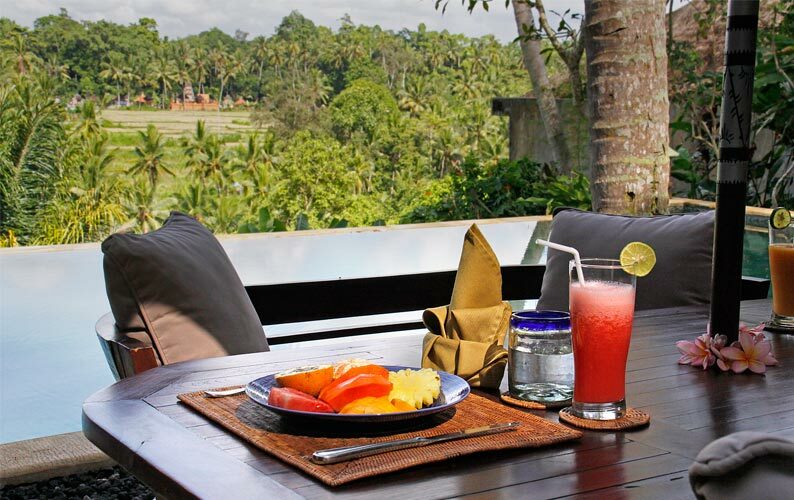 Our villa menu includes Indonesian, Western, Asian, Vegetarian, as well as special selections for children.